We've had another failure at our service provider. The game is currently down for all players on all portals. As with the previous service issue, we cannot directly fix this issue and must wait for our provider to get everything running again. We do not have an ETA on when this will be resolved but have been assured that it is being worked on now. UPDATE: 3:40 PM EST - The severity of the issue is such that we're being told that service won't be resumed for several more hours. We'll keep you posted. In today's release we made a number of balancing changes and added a new promotional bundle for collectors. We also gave a much needed buff to Alisten, who has struggled to compete even after her previous boost. We will be writing a follow up post with a detailed look at some of today's changes. Mana Bloom no longer gains Strong. It actually gains ATK instead. Fixed Power Cast bug that would allow enemy to get benefit if you didn’t play a light alliance creature after playing the spell, and they did. 2012 bug… squashed. There was actually a bug in the old QDC code that allowed you to avoid destroying the QDC on the 5th trigger. It has been fixed and applied to the new design. Dragon Calling (6 Charge) now puts a random Ancient creature with cost of 5+ into your hand (not from your deck) rather than drawing a card. Support is the defensive equivalent of Allegiant. Whenever a creature of the same Kingdom comes into play, a creature with Support will gain 1 HP. 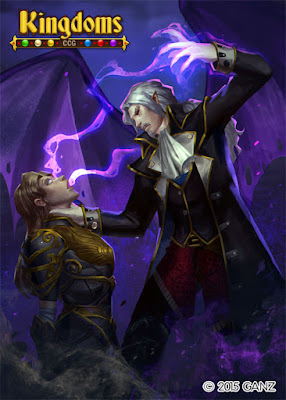 At this time no card directly give Support, but it can be gained through cards and text that grant random abilities. A creature with Doomed is not dead yet, but they will be soon. A creature with Doomed will die at the end of their controller's next turn. 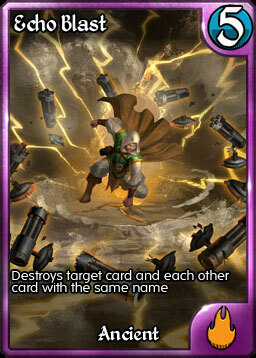 Note that this is not a destroy effect, so will not be prevented with Indestructible or by card text. So get your last hit in. There are currently no cards or abilities that will give Doomed to a creature. The Prize Card for Season 4 is Variant Art Soul Drain. ALL players who are eligible for prizes will also receive a Variant Art Disintegrate - so whether you're rated 2000+ or 1300, get your games in and you'll receive a promo! Echo Blast Promo Pack On Sale Now! For veterans looking to make their deck unique or new players looking to get one of the top cards in the game at a discount, we've created the Echo Blast Promo Pack. For just $20 USD, you will receive 4 variant art Echo Blasts with Limited Edition etching, plus 50 Gems! This offer is only good available until the end of August. 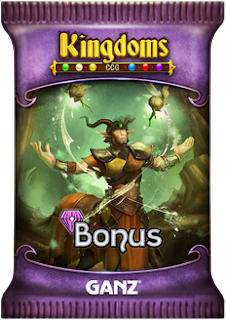 Just a quick note to let players know that Kingdoms CCG will be offline from 8 am EST until noon EST tomorrow, July 16, 2015. This will be for another pure server maintenance. No new content or coding changes will be made at this time. This should complete our maintenance and we'll be back to getting new content up next week. Arena Season 3 is now in the books and its time to look at how we're doing from a balancing perspective. Limited right now is a surprisingly good state. For the first time that I can remember, there is no hero that appears in 20% of games (looking at the top 100 players). The most used Limited Hero is Bahamut who appears in 19% of battles, and has a positive win ratio, but a ratio that is no higher than Akatril who appears in just 7% of battles. Overall I'm very happy with Limited right now. As well, the Raise the Guard combo - Manacycle Wizard, Fae Paragon and Raise the Guard - take up three spots in the top 10 cards played in Standard (2, 3, and 6 respectively). 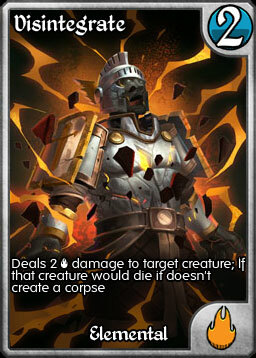 Raise the Guard was one of the first cards on the Watch List and we are now looking at how to get it under control. Both Fae Paragon and Firestorm Shaman (which itself has been a concern for two years) are also being looked at. We will be announcing what changes, if any, will be made next week and encourage players to discuss these cards in the forums. Please note that if Raise the Guard is changed, we will be offering a trade in period. We're not only reviewing the over achieving cards, but also looking at many of the "bottom of the barrel" rares to see if we can give them a little boost. Sure, most still won't make a large impact on competitive play, but if we can make them more fun to allow for niche play, it will be worth it. A thread on this topic can be found here. Have a great weekend and we'll see you on the battlefield!